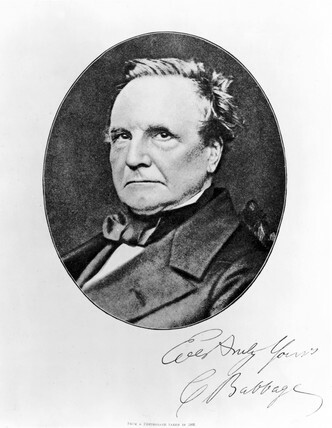 Charles Babbage, British mathematician and computing pioneer, 1860. Photogravure after a photograph taken at the fourth International Statistical Congres in London in 1860 with Babbage's signature. Charles Babbage (1791-1871) was a computer pioneer and inventor, reformer, mathematician, scientist, philosopher and political economist. His Analytical Engine of 1834 was the first calculating engine designed along modern lines and he is said to be the 'father' of computing.